The two were awarded the $15,000 Excellence in Education Innovation award, sponsored by Janus Henderson Investors, from The Succeeds Prize in October for their work connecting students and their families to technology and engineering. Colorado Succeeds recently sat down with Deb and Tara to learn more about their motivation, methods, and success with the program thus far. Colorado Succeeds: Congratulations on winning The Succeeds Prize Excellence in Education Innovation award! What motivated you to apply for the award? 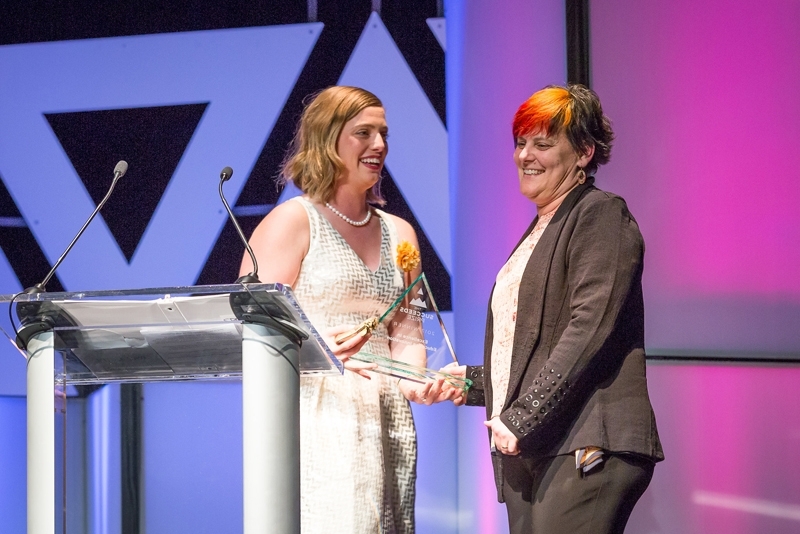 Tara Hardman: Deb and I initially started applying for the award separately and then decided to join forces to launch the Family MakerSpace, incorporating both engineering and technology together. We’d both been dreaming about the idea for several years and were encouraged by the opportunity to receive funding to launch the project. We’d both observed a lack of understanding of technology and engineering fields in our community, as well as a lack of opportunity for our school population to experience tech outside of the classroom. Many families at our school don’t have access to computers or other tech toys in the home. We wanted to create a structured space to introduce tech to the whole family. CS: What does it mean to you and your school community to have won? Deb Harding: Winning the award means a great deal to both of us as teachers and to the school community. We’ve held two events at the Family MakerSpace so far and, with minimal marketing, both events have been hugely successful. To me that says that it’s both wanted and needed. TH: The events provide an opportunity to have more of a connection to my students through knowing their families. Starting the Family MakerSpace means that we’re not just any old school. It means we’re supporting learning both inside and outside of school – for teachers, students, families, and community partners. It feels good to be recognized for those efforts. CS: Tell us more about the STEM Launch Family MakerSpace. DH: We want to provide a welcoming and supportive environment for families to explore engineering and technology together. The Family MakerSpace provides the tools and opportunities for them to be innovators in our community. It’s no secret that there’s an obvious gap in the face of our tech world. Women and people of color are not adequately represented. That’s not going to change because, for the most part, classes are built for students who already have access to technology outside of school. The Family MakerSpace looks at access in a different way by expanding our reach to the whole family. Many families at our school don’t have access to computers or other tech toys in the home. We wanted to create a structured space to introduce tech to the whole family. We have such great technology and programs here at the school – we want to put it all to good use outside of regular school hours. Through the Family MakerSpace, students, and their families will have access to technology tools such as circuit boards and raspberry pi hardware and photo, 3D gaming, and app development software. On the engineering end, we have 3D printers, CAD programs, sewing machines, and woodworking tools. TH: The structure is two-fold. We plan to host four major events this school year open to students and their families. We’ll also host regular ‘open lab’ clubs during the week so students can come in and work on what they’d like to explore. In the future, we’d like to create a lending library to bring tech tools into the home and, eventually, expand this model into other schools. CS: Can you give us an example of a recent Family MakerSpace workshop? DH: We’ve had two community Family MakerSpace events so far, an LED circuit night and an open house. At the former, we invited families to learn about circuits by making a light display using mostly household materials. Family MakerSpace students, our ‘Maker Leaders,’ prepared for the event by learning how to do the project themselves and then led different portions of the project with the families. The Maker Leaders were so proud. One student shared how neat it was to see families make things together. She was excited to see other people interested in what she enjoys doing. We had close to 70 people attend on a Friday evening. TH: One of the reasons we went with the circuit project was because it uses affordable materials that people could use at home to play around with a tech concept. Eventually, we’d like to use what we learned at that event and build on it. How can you create a circuit, for example, and design something that would hold it or something that would move with the lights? There are so many layers we could add to the project down the road. CS: How will you use the award money to support and scale the Family MakerSpace? TH: The $15,000 award from The Succeeds Prize is incredibly helpful to get this project off the ground. We can now purchase tools such as an additional 3D printer, computers for the families to use, as well as resources for families to make projects they can take home such as the LED circuits. CS: What do you hope to achieve through the Family MakerSpace and how will this funding benefit your school and school community? DH: Studies show that parents are key influencers in their child’s career choice. This funding and support provides tools and educational support to extend enrichment and exploratory experiences to the families on computer science and engineering concepts. We’re thrilled to finally see the Family MakerSpace come to fruition. It’s a tangible way to start bridging the gap to tech and engineering careers. TH: There are some other makerspaces out there, but connecting with families and communities is unique to the STEM Launch Family MakerSpace. We’re not the only school with a community that does not have access and we know the pathway to STEM careers begins at home. Ultimately, we want to see if this model works and to bring it to other communities. CS: Community and family involvement is an integral part of the MakerSpace. Why? TH: Family involvement is the key indicator for our students’ success. I cry each time I think of the Family MakerSpace events. Teaching is one thing but being able to see a student’s connection to their family has improved me as an educator. We’re only with our students for 45 minutes a day. Their parents are with them for the long haul and the connection and shared learning is heartwarming to witness. DH: We want the Family MakerSpace to be a safe place for all to explore and learn. We want families to know that ‘not knowing’ is not a bad thing. It’s okay if you don’t know. It’s the growth mindset for all that we’re after. CS: What advice would you give to other educators exploring ‘outside the box’ innovation? TH: Little by little! This project has been brewing for a long time and it will continue to grow and develop in the future. We haven’t purchased a kit to teach an ‘outside of the box’ method, we’re learning as we go and improving from there. I also want to be clear that we don’t see ourselves as saviors to the community. We recognized a gap and we’re trying to help support the learning of other people through the Family MakerSpace. DH: I’d encourage other educators to really spend time thinking about the community you’re working in and what could be valuable. It’s important to recognize that we’re all learning together. It’s not a one-way learning experience. Our success with the Family MakerSpace really speaks to the leadership here at STEM Launch. We’re incredibly lucky to have leaders of the school district allowing this type of innovation. When we proposed the concept, the response from our leadership was “how can we help support you to make it happen?” That’s made all the difference in our success.